Lake Erie "George Finnie" buoy removed for season September 17/18. See NOTSHIP below. Lake Erie "Carlingford" buoy removed for season September 17/18. See NOTSHIP below. Lake Erie "Stonewreck" buoy removed for season September 17/18. See NOTSHIP below. Lake Erie "Niagara" buoy removed for season September 17/18. See NOTSHIP below. Lake Erie "Raleigh"removed buoy for season September 28/18. See NOTSHIP below. Lake Erie "CB Benson" buoy removed for season September 28/18. See NOTSHIP below. Lake Ontario "Tiller" buoy removed for season November 12/18. See NOTSHIP below. NOTSHIP C1062/18 Lake Erie - East end - Chart 2120 Orange and white mooring buoy marked "PRIV" placed in position 42 46.262N 079 14.609W marking the shipwreck "CB Benson". 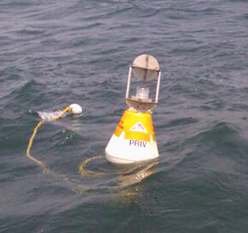 Buoy is equipped with flashing amber light FL4s and Radar reflector. NOTSHIP C1765/18 Lake Erie - East end - Chart 2120 Orange and white mooring buoy marked "PRIV" placed in position 42 40.076N 079 23.780W marking an unidentified shipwreck commonly known as the "Stonewreck" (formally thought to be the "JD McGrath"). Buoy is equipped with flashing amber light FL4s and Radar reflector. Buoy removed for winter September 17, 2018 NOTSHIP C2354/18. Please!! If you notice a problem with any of the moorings listed above, please notify Niagara Divers' Association so we may update the list and perform any repairs. As many of you may be aware, the Niagara Divers’ Association has been involved in mooring shipwrecks in Lake Erie’s Eastern Basin for several years. We have been installing concrete blocks, chain, line and floats on shipwrecks in both the US and Canadian waters. Although we had plans to manufacture approved buoys, we had held off due to lack of funds. At Shipwrecks/2002, Save Ontario Shipwrecks stated that they may be able to help in the near future. They later donated two buoys that year. In the fall of 2002, SOS announced they had received a $21,000.00 Trillium Fund Grant to allow them to moor 50 shipwrecks in the province of Ontario. At the February 4, 2003 monthly NDA meeting, guest speaker Jim Friend of SOS announced that the NDA would be receiving five more buoys for Coast Guard approved sites in Lake Erie, bringing us up to a total of seven. 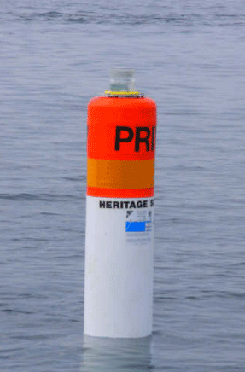 All seven buoys were installed in May/ June 2003. Over the years we have had to replace all of these medium duty buoys, as they do not hold up well to the rigours of open lake waters. For the 2009 season we tested two heavier duty "GDI 0.25 Buoys" which held up very well. By the end of 2009 three more of the original style smaller buoys were in need of replacing and a decision was made to order five more of the new "GDI 0.25" style to be put out for the 2010 season. These new buoys all have internal radar reflectors and solar lights. The few medium duty buoys we have remaining will be kept to be used as spares. 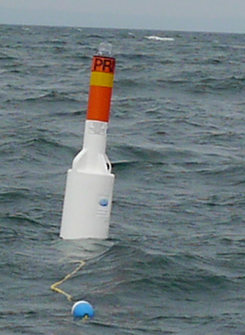 The buoys were received and put out during the 2010 season. In 2011 we had a group purchase with SOS of the larger 0.30 GDI buoy which is now installed on the Port Dlhousie "Tiller Wreck" and Lake Erie's "Niagara" wrecks. It is the responsibility of the NDA to properly install in the spring, maintain and remove each fall. We also notify the Coast Guard’s “Notice to Mariners” as to the status of the buoys. 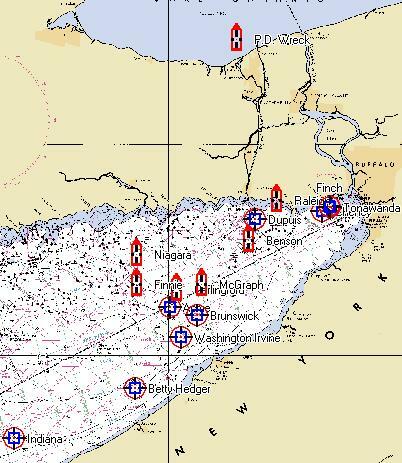 The above chart shows the shipwrecks on which we have placed moorings. The targets represent shipwrecks with line and small floats. The small ships represent the Canadian Coast Guard approved sites with concrete block anchors and buoy moorings.